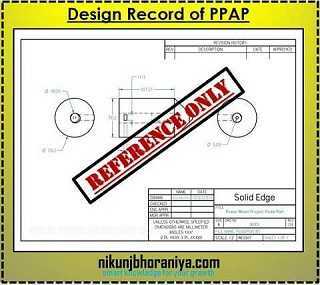 PPAP Documents | What is PPAP (Production Part Approval Process)? HomeQuality Core ToolsPPAP Documents | What is PPAP (Production Part Approval Process)? 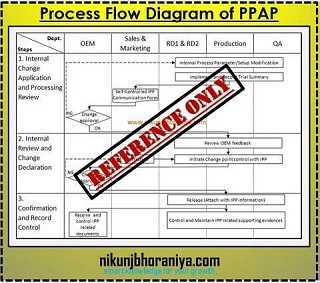 What is PPAP (Production Part Approval Process)? → PPAP is the Production Part Approval Process. → It is a very important tool for establishing confidence in product suppliers and their production processes." → ISO 9001:2015 and IATF 16949:2016 is used to formally reduce risks prior to product or service release, in a team-oriented manner, using well-established tools and techniques. → AIAG’s 4th edition effective June 1, 2006, is the most recent version of the Production Part Approval Process. → Production Part Approval Process has now spread to many different industries beyond automotive. → Production Part Approval Process Provide evidence that all customer engineering design record and specification requirements are properly understood by the organization. → To demonstrate that the manufacturing process has the potential to produce the product that consistently meets all requirements during an actual production run at the quoted production rate. → The purpose of a Run @ Rate is to verify the supplier’s manufacturing process is capable of producing components. → Successful Run @ Rate means it meets Your Company's Quality Requirements, at quoted tooling capacity, for a specified period of time. → Verification of the Run @ Rate will be at the Supplier Quality Engineer’s (SQE) discretion. → The supplier will be notified of the need to perform a Run @ Rate as early in the process as possible. → And the number of components to be produced during the Run @ Rate should be sufficient to demonstrate process capability and will be predetermined by the Supplier Quality Engineer and the supplier. → The no. of components to be produced, it may vary as per the customer's specific requirement. → There are five levels of PPAP submission which is mentioned in the below figure. Level 5: Production Warrant, product samples and complete supporting data (review will be at the organization's location). ➤ Note: → For each level, full APQP is required as per customer's requirement. → The PPAP level simply indicates which elements you submit, and which you retain at your site. → If the customer is responsible for designing then this is a copy of the customer's drawing that is sent together with the Purchase Order (PO). → If the supplier is responsible for designing this is a released drawing in supplier’s release system. → Authorized Engineering Change Documents is a document that shows the detailed description of the change and it is required in PPAP if applicable. → Usually, this document is called “Engineering Change Notice(ECN)”, but it may be covered by the customer PO or any other engineering authorization. → This approval is usually the Engineering trial with production parts performed at the customer plant. → A “temporary deviation” usually is required to send parts to the customer before PPAP. → Customer may require other “Engineering Approvals”. → A copy of the Design Failure Mode and Effect Analysis (DFMEA), reviewed and signed-off by supplier and customer. → A copy of the Process Flow, indicating all steps and sequence in the process, including incoming components to final part dispatched and it is required in PPAP. 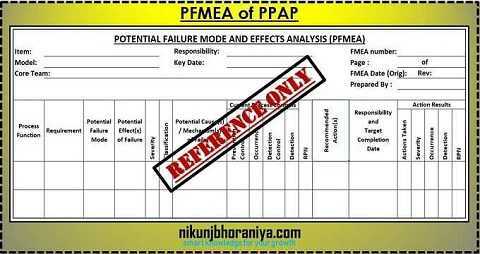 → The PFMEA follows the Process Flow steps, and indicate “what could go wrong” during the process and assembly of each component till product dispatched. → A copy of the Control Plan reviewed and signed-off by supplier and customer and it is required in PPAP. → The Control Plan follows the PFMEA steps and provides more details on how the “potential issues” are checked in the incoming quality, assembly process or during inspections of finished products till dispatched final product. → MSA usually contains the Gage R&R for critical or high impact characteristics. → MSA gives confirmation that the measurement system (an instrument and appraiser) is able to measure these characteristics of the product. → A list of every dimension noted on the ballooned drawing. → This list shows the product characteristic, specification, the measurement results and the assessment showing if this dimension is “ok” or “not ok”. → This summary is usually on a form of DVP&R (Design Verification Plan and Report), which lists each individual test when it was performed, the specification, results and the assessment pass/fail. → The DVP&R shall be reviewed and signed off by both customer and supplier. → In addition, this section lists all material certifications (steel, plastics, plating, etc. ), as specified on the print. → Usually, this section shows all Statistical Process Control Charts affecting the most critical characteristics. → The intent is to demonstrate that critical processes have stable variability and that is running near the intended nominal value. 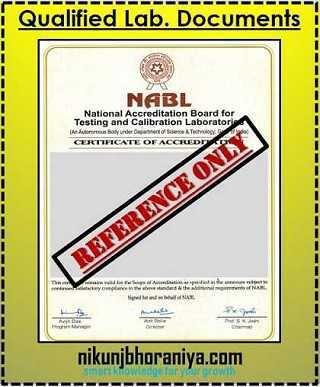 → Copy of all laboratory certifications of the laboratories that performed the tests reported. → A copy of the AAR (Appearance Approval Report) form signed by the customer. → Applicable for components affecting appearance only. → A sample from the same lot of initial production run. → The PPAP (Production Part Approval Process) package usually shows a picture of the sample and where it is kept. → A sample signed off by customer and supplier, that usually is used to train operators on subjective inspections. → When there are special tools for checking parts, this section shows a picture of the tool and calibration records, including a dimensional report of the tool and it is required in PPAP. → Each customer may have specific requirements to be included on the PPAP. → This is the form that summarizes the whole PPAP package. 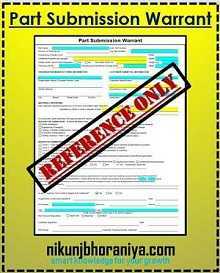 → This form shows the reason for submission (design change, annual revalidation, etc.) and the level of documents submitted to the customer. → There is a section that asks for “results meeting all drawing and specification requirements: yes/no” refers to the whole package. → The part meets all the customer's requirements. → The supplier is authorized to ship production quantities of the part. → Permits shipment of the part on limited time or piece quantity basis. → The part does not meet the customer's requirements. Very good and interesting material. I’m very familiar with the PPAP however the way how it is explained kept me engaged.